Snæfellsnes peninsula in Iceland is mostly known for its spectacular scenery and the majestic Snæfellsjökull glacier. 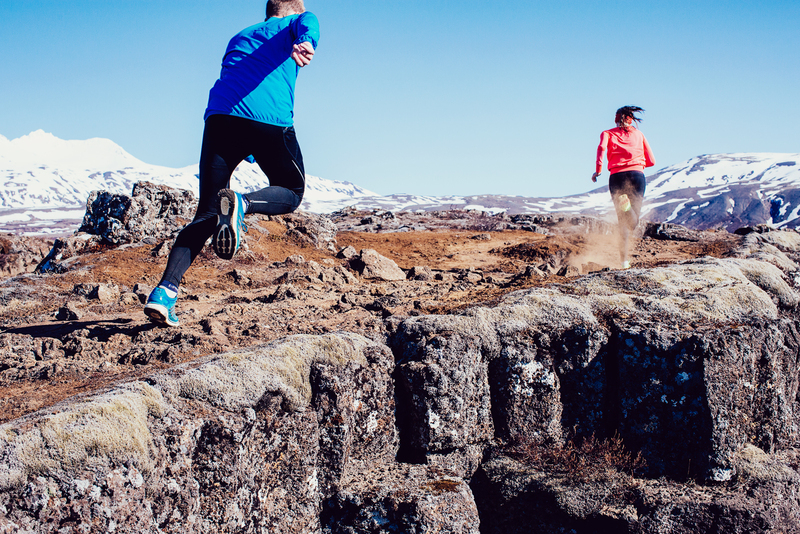 But it is also the home of one of Iceland’s best trail races (it was voted the best in 2016), the Snæfellsnes Trail race. The race is a 22 km long and goes from the south coast of the peninsula across the mountain range in between and over to the north coast. The race starts at the idyllic village of Arnarstapi, a thriving center of local tourism with a busy harbour and many attractions nearby. The course mainly follows an old gravel road next to the mystical Snæfellsjökull glacier, also an active volcano. The first 9 km or so are uphill, until you are up to around 700m height. The road has different variations of steepness, so in between steep hills runners get short (very short!) breaks from the climb. Snæfellsjökull glacier gained worldwide fame in Jules Verne‘s classic novel “Journey to the Center of the Earth”. There have been movies too, including the 2008 one with Brendan Fraser that you should perhaps avoid. The glacier and the surrounding area is a national park. On a clear day the glacier is the most magnificent sight seen from the capital Reykjavik. But nothing beats seeing it up close. You can almost feel the powers so many people believe flow from it. The race is run on the sides of the volcano, very clearly visible most of the way unless covered in clouds. Did the energy from the glacier help us up those hills? Not as much as we had hoped for! Usually the upper part of the course is covered in snow. However, this winter had been exceptionally mild so the Icelandic road services had managed to dig a way through, the first time that had happened since the race started six years ago. That meant there was no snow on the course, only 2 meters high snow walls on each side of the road. Last year and every year before, runners had to run in deep snow for 5 km or more. Running downhill you go past those who have spent all their energy going up while those strong downhill runners come flying past. It is important to stay focused for the downhill run, as the course is pretty steep in places and fairly rough as well. Going downhill for so long is tough on the thighs and the last flat 2 km running into the fishing village of Olafsvik are not as easy as they look. Many people we met claimed it was their toughest part of the race! After the finish line in Olafsvik we had the most amazing fish soup, one of the best we have tasted. Energy drinks, chocolate and coffee were also on offer. Even if Olafsvik is not a big town there was great support at the finish line and you could feel the whole community taking part and enjoying the day. We sat in the sunshine and chatted to other runners for an hour before heading to the local swimming pool for a dip. The race is very well organized with a lot of care and attention taken to every detail. We will definitely be back! Snæfellsnes is a place where you should do more than just take part in this great race. You can go to the top of the glacier in a snowmobile, visit the black beach of Djúpalónssandur, explore the Vatnshellir cave near Arnarstapi, taste shark in Bjarnarhöfn, admire sea cliffs full of birds and so much more. Driving around Snæfellsnes it seems like almost every 5 minutes there is a place where you must stop and get out of the car. We highly recommend spending a night in Snæfellsnes before or after the race and spend a whole day sightseeing.